Our team is comprised of many hard-working, talented and loyal individuals who all work together to forge relationships with our clients, with each other and with the community we share. We all work together to effectively communicate and deliver high-quality, American-made products to our clients every single day. 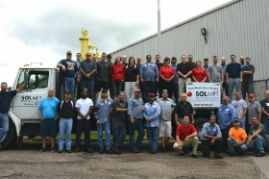 Because Solmet Technologies is a family owned and operated company, we strive to treat all of our employees like family. It’s because of this that we have retained many of our key employees over the 30 years we’ve been in business. In fact, nearly half of our employees have been with the company for more than ten years; one of our employees has been with us from the very beginning! We believe in treating our employees with respect and strive to create a positive, safe and nurturing work environment centered on American values. Our employees participate in golf outings, holiday parties and volunteer days throughout the year in order to foster camaraderie and team building among different departments. Want to know more about our team? Contact us today! Canton, OH (July 30, 2018) —Solmet Technologies, a local manufacturer of commercial open-die steel forgings, has promoted three members within its leadership team.